Use a 3D area chart to compare trends in two or more data series over a period of time or in specific categories, so that data can be viewed side by side. Note: To view a chart in 3D, in the ChartAreas property open the ChartArea Collection Editor and set the ProjectionType property to Orthogonal. The LineBackdrop property gets or sets the backdrop information for the 3D line. The Thickness property gets or sets the thickness of the 3D line. The Width property gets or sets the width of the 3D line. Below is an example of how to set the custom chart properties at run time for a 3D area chart as shown for the first series in the image above. 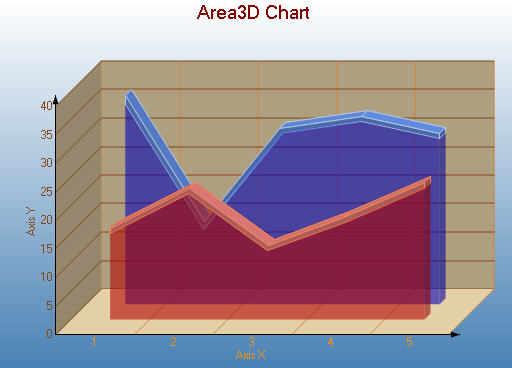 3D stacked area chart displays stacked area chart in 3D. The Width property gets or sets the width of the 3D stacked area. 3D stacked area chart (100%) displays stacked area chart in 3D (100%).